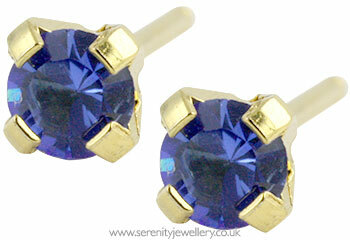 Studex Sensitive 3mm sapphire colour crystals tiffany set in hypoallergenic 24 carat gold plated surgical steel stud earrings with matching butterfly backs. Please note: These earrings do have more pointed tips to the posts than most Studex Sensitive earrings. This can bee seen in the photo showing the earring from the side. 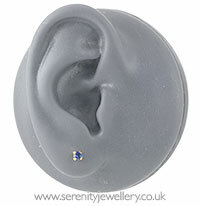 These are beautiful earrings, which look classic and expensive. They are exceedingly good value and I will be buying more.